For those who don’t have time to hike, there is still much to see and enjoy along the roadsides in Kōke`e State Park. See Shop for Road Guide to Kōke`e and Waimea Canyon State Parks. Recommended time allowance: 45 minutes to one hour, 3 stops (Puu Hinahina Lookout, Koke`e Natural History Museum, Kalalau Lookout). There are several established lookouts along the road, as well as several informal but paved pull-outs where you can get an unfolding view of Waimea Canyon. WARNING: Please keep within guard rails and fences; do not attempt to stand at steep edges for that photo! Waimea Canyon Lookout : A little past the 10 mile marker on HWY 550, offers the most expansive view into Waimea Canyon. Comfort stations provided. Puʻukapele Lookout (not signed): Informal pullout with waterfall view (Waipo’o Falls). 75 m past the 12 mile marker on HWY 550. It’s right across the street from a cluster of picnic pavillions and a comfort station. Puʻu Hinahina Lookout: With a view into the canyon as well as out to the Island of Niʻihau, is located less than a mile beyond the waterfall view. Well marked. Comfort stations provided. To visit Waimea Canyon and Koke’e State Parks, drive up from the coast on Highway 50 from the town of Kekaha, which is about 3 miles past the town of Waimea. Highway signs clearly mark the turn up to the mountain parks. You’ll be driving up through abandoned cane fields which are now being taken over by introduced trees like Silky Oak, Black Wattle, and Paperbark Eucalyptus, all Australian transplants. Reforestation to control erosion caused by cattle began in the 1930s with the introduction of these Australian trees. During spring, horizontal clusters of feathery orange-gold blossoms cover the tall silky oak trees. Kaua‘ i is 5.5-6 million years old. During that time, wind and water have carved away the original volcano to reveal layers of old eruptions—it’s like looking back in time. The brilliant red earth tones of the cliffs, softened by the greens and golds of plants, change as the sun moves over the gorge. 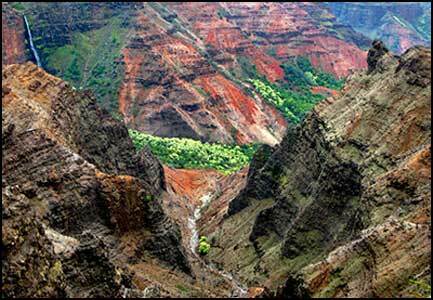 The name Waimea refers to the reddish water (wai = fresh water, mea = red) that floods from the canyon after heavy rains. Think about the forces of nature working over eons of time, building then carving away layer upon layer of lava to expose the interior of Kauai’s original volcano. Kaua‘ i is the high-island stage of an eroding volcano. After this stage, the Hawaiian islands erode down to the Northwest Islands, which are uninhabited low islands and shoals extending 1500 miles beyond Kauai. These are now part of a newly designated wildlife preserve. Erosion of the canyon walls has been accelerated by goats, now wild in Waimea Canyon. Goats were introduced to Kauai in 1792 by English sea captain George Vancouver. Hawaiian island ecosystems evolved without any four-footed mammals which have been extremely destructive since their introduction. One of the best resources for understanding the geology of Kaua‘ i is “Kauai’s Geologic History, A Simplified Guide” by geologist Dr. Chuck Blay, which is available for purchase by Clicking Here. Highway signs clearly mark the turn up to the mountain parks. You’ll be driving up through abandoned cane fields which are now being taken over by introduced trees like Silky Oak, Black Wattle, and Paperbark Eucalyptus, all Australian transplants. Reforestation to control erosion caused by cattle began in the 1930s with the introduction of these Australian trees. During spring, horizontal clusters of feathery, orange-gold blossoms cover the tall and beautiful—but invasive—silky oak trees. Please visit the museum for trail guidance and for maps to take with you. Most of the trails in these two parks are in Koke’e State Park. However, there is one short and one long trail between the 8 and 9 mile markers. Both are well marked. There is a paved parking apron along the left side of the road. 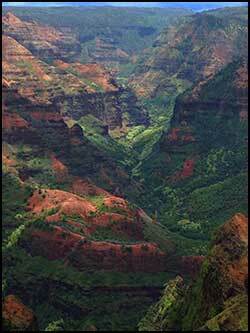 Great shots of Waimea Canyon and Koke`e are posted frequently on our Facebook page. Check it out! Watch for our upcoming gallery of photos of the Waimea Canyon on Kauaʻi. Thanks for your patience! Kukui Trail takes you into Waimea Canyon. This steep trail, starting at about 2700’ elevation, winds two miles to the botttom of the canyon. Because it is used by hunters on horseback, it is shaley and loose. You’ll be descending, so you begin to lose views and it is hot and dusty. The climb back is arduous. 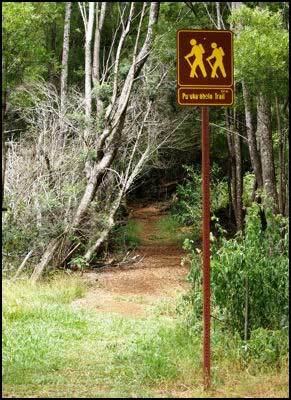 If you can get someone to drop you off at this trailhead, you may choose to walk seaward along Waimea River to Waimea Town and the ocean. Right at the top of Kukui Trail, there is a short, half-mile nature loop that gives you a good sense of Kauai’s dry forests. We recommend you go left. The trail is named after the Iliau plant, a relative of the Hawaiian silversword that in all the world grows only on Kauai. Invest 15 minutes to explore the native plants and enjoy the vistas of Waimea Canyon and Wai‘alae Falls, which are midway along this stroll. There is a covered picnic shelter along this trail, right where it intersects with Kukui Trail. For those who don’t have time to hike, there is still much to see and enjoy along the roadsides in Kōke`e State Park. Visit the museum shop to get a copy of the Road Guide to Kōke`e and Waimea Canyon State Parks. WARNING: Please keep within guard rails and fences; do not attempt to stand at steep edges for that “one last” photo! 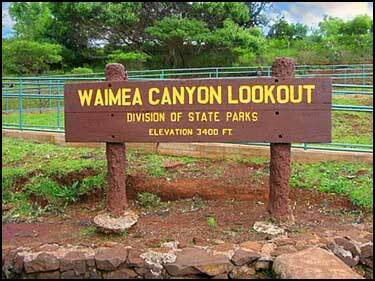 Waimea Canyon Lookout: A little past the 10 mile marker on HWY 550 offers the most expansive view into Waimea Canyon. Comfort stations provided. Puu Hinahina Lookout: With a view into the canyon as well as out to the Island of Niihau, is located less than a mile beyond the waterfall view. Well marked. Comfort stations provided. Kalalau Lookout: Weather Permitting, Kalalau Lookout offers dramatic views through the valley to the ocean, almost 4,000 feet below. After heavy rains, small waterfalls can be seen rippling down the folded cliffs. First thing in the morning is the best time to see the view. Comfort stations provided. Pu`u ka pele Lookout (not signed): Informal pullout with waterfall view (Waipo’o Falls) .75 m past the 12 mile marker on HWY 550. It’s right across the street from a cluster of picnic pavilions and a comfort station. Consult our Museum staff for good hiking directions and maps. Below are some good guidelines for hiking gear. Remember you can stop by Kōkeʻe Museum for some awesome and inexpensive hiking sticks, as these are an especially good idea if the trails you take are wet or steep. Closed toe shoes as ankle support is important - Long pants. Bring sunscreen – although Koke`e State Park's temperature is cooler than other areas of Kauai, sun radiation is actually stronger at park elevations which range up to almost 4000’ above sea level. Bring drinking water & carry snacks. Your camera is a must. Always stay on the trail. Stay well back of edges! The park composed of is 6.5 million year old crumbling lava, not firm sedimentary rock! Report any trail problems to Koke`e Natural History Museum staff such as fallen trees, slides, etc. Please note: Cell phones do not receive or send in Koke`e State Park. All park trails can be muddy and slippery in wet weather or after heavy rains which can be frequent in winter months. Always check with staff at Kōke’e Natural History Musuem for current trail conditions and advice. Trail Length: The walk on Halemanu Road to the beginning of the trail is .8 mile, with a right hand turn when you reach the top of the hill at .6 miles. Cliff Trail is to the right and is .4 mile round trip. Canyon Trail forks downhill to the left and is .8 mile to Waipoʻo Falls. Round trip from Hwy 550 to Waipoʻo Falls is 3.6 miles. 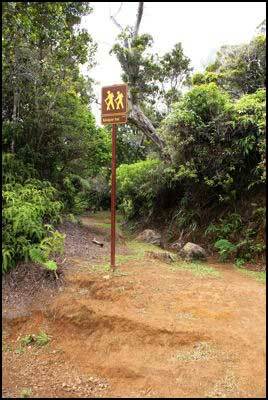 Trail Description: One of the most popular family hikes, this ridge-top trail provides great views of Waimea Canyon. Most hikers only go as far as Waipo’o Falls. There is a small pool surrounded by yellow ginger upstream from the main falls. The trail includes a climb of several hundred feet in elevation, and steep drop offs along the Canyon rim. How to get there: From Koke‘e Museum, turn left on Hwy 550, then turn right on the first dirt road, there is a sign that says “YWCA Camp Sloggett”, drive 1/2 mile and park in the area of the Camp Sloggett sign. Walk 150 yards down the dirt road toward Camp Sloggett to reach the trailhead, which is just before the first cabin on the right. Trail Length: A round trip hike to Halemanu Valley and back on the Koke‘e – Halemanu Trail is 2.4 miles. A loop that includes the “No Name Trail”, then back to Hwy 550, is 2.5 miles. Trail Description: The trail climbs uphill through koa forest. Following a climb of 300 feet in elevation, the trail continues along the ridge then drops into Halemanu Valley near some cabins. From here, you can return to the paved road via the .1 mile “Unnamed Trail” that comes out on Faye Road. How to get there: From Koke’e Museum, Turn left on Hwy 550, then turn right on the first dirt road (Sign says”YWCA Camp Sloggett”), drive 1/2 mile and park in the area of the Camp Sloggett sign. Take the second turnoff (just beyond the turnoff to Camp Sloggett). Continue past the old drinking water pond, .2 miles to the Waininiua Trailhead on the left, or to the end of the dirt road (1/2 mile past the pond), to the Kumuwela Trailhead. Trail Length: Both trails lead to Kumuwela Road, a dirt road that branches off Camp 10 – Mohihi Road. 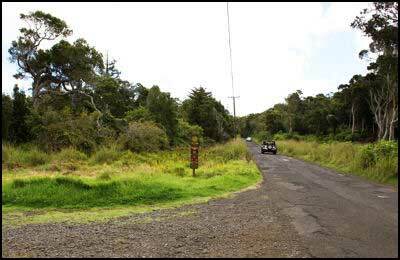 Waininiua Trail is 1/2 mile, Kumuwela Trail is 1 mile and a loop that includes both is 3 miles plus the road. Trail Description: Both trails pass up and downhill through mixed native and introduced forests. The Waininiua Trail is generally in better condition, and can be hiked as part of an extended loop from either the Canyon Trail or Pu’u Ka ‘Ohelo – Berry Flat Trail. The Kumuwela Trail includes a climb of 400 feet in elevation. How to get there: From Koke‘e Museum, turn left on Hwy 550 and at the first dirt road, there is a “YWCA Camp Sloggett”, turn right. Stay on the main dirt road for .9 miles, and park near the water pump. Walk uphill on the dirt road to your left .2 miles to the trailhead, past the first cabin on the left. Trail Length: The Loop Trail is 2.2 miles. 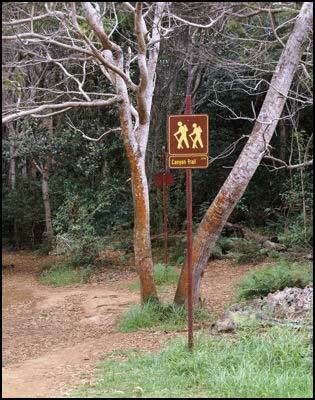 Trail Description: This is a great trail to experience a variety of forest types in a short distance. Pu‘u Ka ‘Ohelo Trail goes uphill through a mix of native and introduced forest trees, passing through a grove of strawberry guava (waiwi) to a trail junction at .2 miles. Turn right at the trail junction, through a section of large koa trees where you are likely to hear or see native forest birds. The trail continues to a grove of sugi pine, then turns right (avoiding the dead end hunters’ trail) to pass through eucalyptus and California redwood to reach the dirt road at 1.4 miles. Walk downhill to the right on the dirt road to return to the water pump. NOTICE: As of late May 2013, the connecting trail between Nualolo Trail and ʻAwaʻawapuhi Trail (called Nualolo Cliff Trail) is CLOSED until further notice. Slides have chewed the trail down to 6″ wide in some places and it will need reengineering. How to get there: For Awa‘awapuhi, turn left on Hwy 550 and drive 1.6 miles to a clearing on the left side of the road, past mile marker 17. 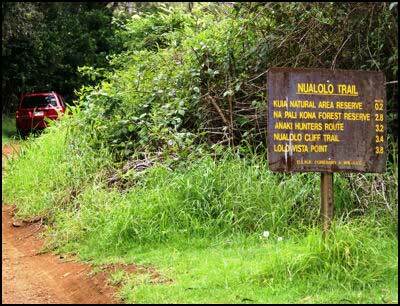 To reach Nu‘alolo Trailhead, turn right on Hwy 550, past the state park building and walk 100 yards south. Trail Length: Nualolo Trail is 8 miles up and back. The Loop Trail (CLOSED, see above) is 8.7 miles (with an additional 1.6 miles on the road back to your car.) Awa‘awapuhi Trail is 6.2 miles round trip. 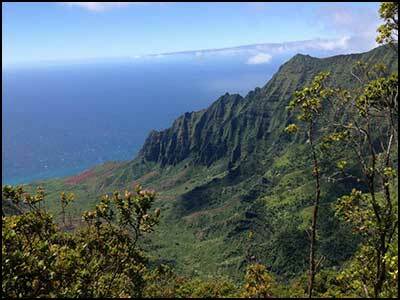 Trail Description: A very popular though strenuous trail with spectacular views of the Na Pali coast. Most hikers who do the full loop begin on Nu‘alolo Trail and turn right (north) at 3.2 miles onto Nu‘alolo Cliff Trail to connect with Awa‘awapuhi Trail. Turn left for excellent views from the end of Awa‘awapuhi Trail, which ends on a narrow ridge dropping off 2,000 feet to valleys below. From here, it is a 3.2 mile climb back to Hwy 550, including a 1,600+ foot climb in elevation. General Notes & Special Warnings: This is the longest day hike in Kōke‘e State Park. Both Awa‘awapuhi and Nu’alolo descend steadily, dropping about 1,500 feet in elevation, going from rain forest to dryland forest until reaching the scenic cliffs. The return is all uphill. Those who have less time hike one or the other. Museum interpreters often advise taking Awa‘awapuhi because it descends less steeply than Nu’alolo and has considerable plant interest before reaching the cliffs. There is no view until the end of each trail, and you “earn” it on the way back! Because these trails trace the western slopes of Kōke`e, they get lots of sun in the afternoon. Water a must! Sun-screen is highly suggested! How to get there: From Koke‘e Museum, turn left on Hwy 550 and drive 1.9 miles north to a small pullover on the right hand side of the road. You can also park along Hwy 550 near the Awa‘awapuhi Trailhead. The trail ends on Hwy 550 about .3 miles past the Kalalau Lookout; 1.0 miles from the trailhead. Because the trail goes from road to road, many hikers park, walk in as far as they want and then return to their vehicle (instead of walking along the road). Trail Length: 1.25 one way; 2.5 miles roundtrip. 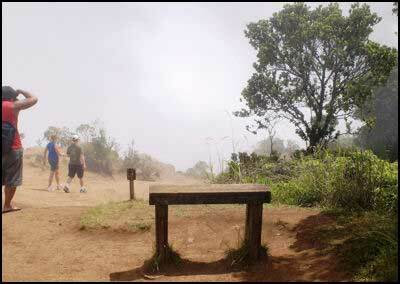 Trail Description: One of the flattest trails on Kauaʻi, this is an easy hike, with a climb in elevation of just 120 feet. The trail passes through a moist forest where native forest birds may be seen. 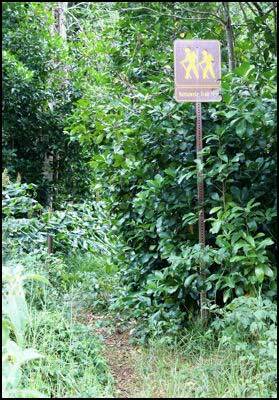 An eastward branch of the trail in a strawberry guava grove is a dead-end, hunters’ trail-we do not recommend you venture here – itʻs easy to get lost. General Notes & Warning: This is entirely a forest trail, with no “long views” or vistas. Parking is a challenge. There is only room for two or three cars. You can also park at the end of Kalalau Lookout parking lot and walk several hundred yards to the Kaluapuhi Trail head. How to get there: From Kōke`e Museum, turn left on Hwy 550 and drive 3.8 miles to the end of the road at Pu’u o Kila Lookout. Trail Length: Pihea Peak is reached 1.3 miles beyond Pu’u o Kila Lookout. This portion of Pihea Trail traces the back edge of Kalalau Valley with extraordinary views into this huge valley and out to sea. It connects with the Alakaʻi Swamp Trail; round trip to Kilohana overlook is 8.6 miles. Pihea Trail is 3.7 miles one way down to Kawaikoi Stream, and Alaka’i Swamp Trail is 3.5 miles from “Camp Sloggett” Road to Kilohana overlook. Trail Description: Pihea Trail provides great views of Kalalau Valley along the rim, good territory for watching native forest birds and a look at a native rainforest. Clay soils that are slippery when wet and a climb of several hundred feet in elevation make this trail challenging. At 1.2 miles, a steep fork left leads to Pihea Peak. At 1.6 miles, a section of boardwalk has been constructed. Continuing to the right at the Alaka’i Trail junction on the boardwalk leads to Lehua Maka Noe, a small bog. Turning left on the Alaka’i Trail, the boardwalk continues downhill towards Kawaikoi Stream. After crossing Kawaikoi Stream, the trail goes up a ridge then across very boggy and foggy forestlands to Kilohana overlook on the rim of Wainiha Valley, with great views of Kaua’i’s north shore (weather permitting). For those who want more mountain than a day-trip offers, there are a variety of overnight accommodations for visitors to Waimea Canyon and Koke`e State Parks. All are varying degrees of “rustic,” from the 12 rental cabins managed by the Lodge at Koke`e to various church and group camps. All require prior reservations. Most of the camps accept reservations from anyone interested, though a few have restrictions. The CCC Camp, for instance, is reserved from park volunteers, researchers, and Hui o Laka program participants. There are two approved camp sites in the Kōkeʻe region. The most accessible is at the head of Kanaloahuluhulu Meadow in Kōkeʻe State Park, and includes grills as well as a comfort station with (cold) showers. The other campsites, Sugi Grove and Kawaikoi, require a 4-wheel drive vehicle to get to and are on opposite sides of Kawaikoi Stream. Permits are required for both camp sites, and may be obtained through DLNR/State Parks Division. Great shots of Koke`e are posted frequently on our Facebook page. Check it out! Watch for our upcoming gallery of photos of the Koke`e on Kauaʻi. Thanks for your patience!